Hello Topsy Turvy readers! 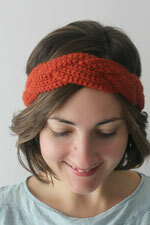 I am so excited to have the opportunity to share crochet patterns with you each month! I blog over at Love City where I write about things that I love most (my boys, crochet, and motherhood). You can also learn more on my about me page! 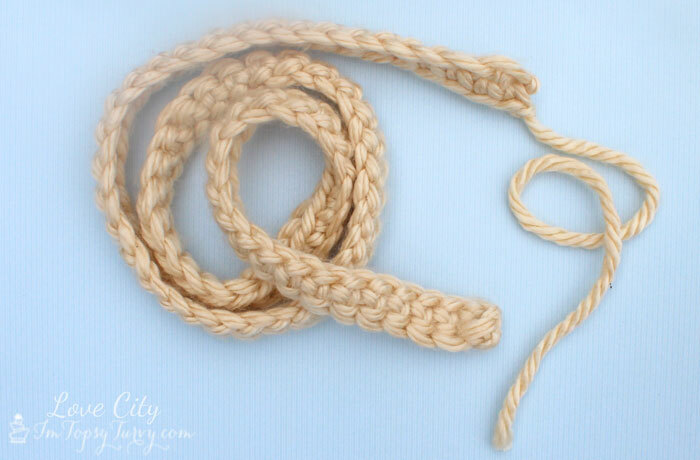 For a while now, I have been wanting to share some crochet tutorials that focused on basic stitches. I want to help beginners learn each crochet stitch, pattern by pattern, gradually increasing in difficulty, until they feel like experts! My monthly contribution here on I’m Topsy Turvy seems like the perfect platform for such a series! If you have been itching to learn crochet, but feel a little bit intimidated, these tutorials are made just for you! There’s no need to feel overwhelmed by intricate charts and symbols. We are going to make some fabulous projects, one stitch at a time! 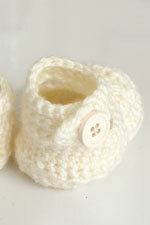 For any of you crochet experts out there, never fear! These projects are going to be so fun and unique and I know that you will love them! 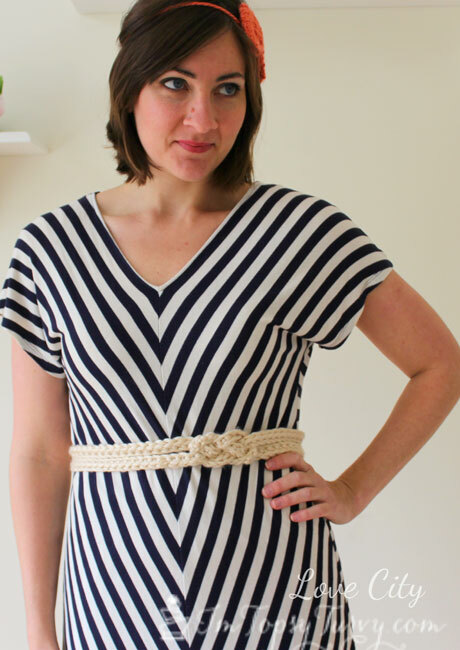 I am loving anything “nautical” right now, so I thought it would be fun to try out my knot tying skills with this sailor’s knot crochet belt! 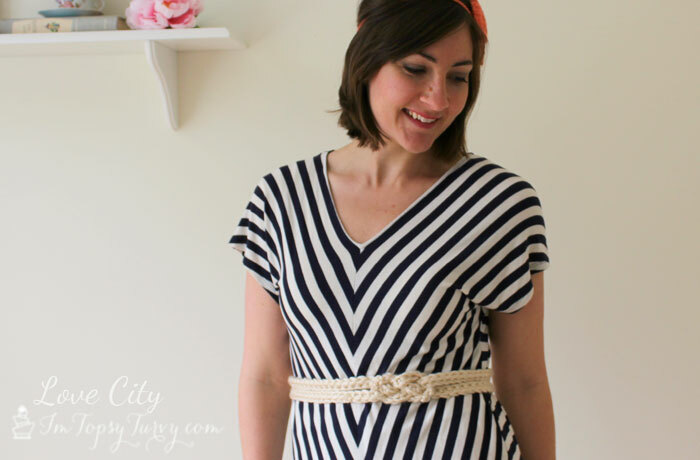 With this belt, the only stitches you need to know are Chain and Single Crochet. Chain (ch)- Fasten on with a slip stitch. Yarn over hook and pull through the loop that is on the hook. 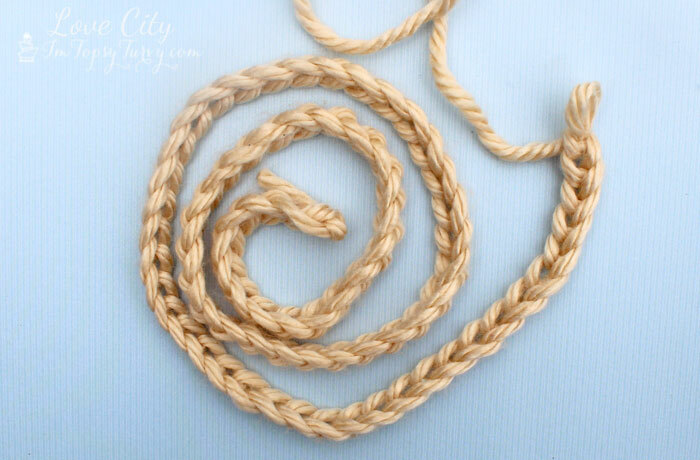 A chain stitch will create a long, continuous strand of interlocking loops. Single Crochet (sc)- Place hook into stitch. Yarn over hook and pull back up through stitch. Yarn over hook again and pull hook through the two loops on the hook. 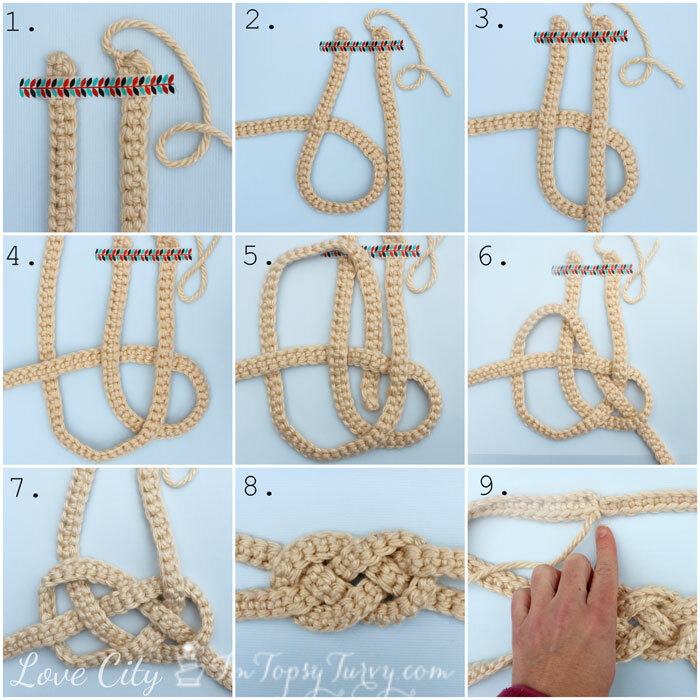 One loop should remain on the hook when completed. 1. With measuring tape, loosely measure your waist. Add 1/2 to 1 inch to that measurement. 2. Ch until strand matches your measurement from step 1 in length. 3. Sc in 2nd ch from hook. Sc in each remaining st.
4. Fasten off, leaving a 5 inch tail. 5. On a flat surface, take the end of each strand and tape them down. With one strand, tape the end with no tail. With the other strand, tape the end that has the 5 inch tail. 7. Attach the sewing needle to one 5 inch tail and sew to the corresponding tail on the other side (as shown in block 9 above). Do the same with the other two tails. Finish off and weave in loose ends! 8. Put on your belt and admire your handiwork! If you’re a little stuck, and need more visual instruction on how to tie the sailor’s knot, I made a fun little instructional video for you! Stop by my blog, Love City, today and check it out! I’m also sharing a nautical themed embroidery hoop that sits so cutely in my kid’s bathroom! 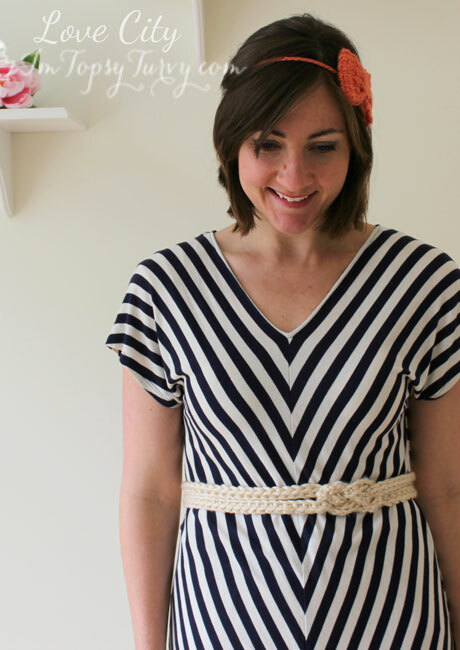 I plan on wearing my belt over some of my favorite spring dresses! I’m already dreaming of a beach side, sunset stroll with my sunhat, cute belt, and dress flowing in the breeze. How will you wear yours? What color will you choose? I’m so glad you liked it! I, too, am in a knot frenzy lately! Also, I love your suggestion, “Topsy Turvy Team” is perfect! I’ve been wanting to learn how to crochet! LOVE the photos! I need photos, and I’m actually confident I can follow these instructions. Thanks talented ladies! I’m so glad to hear you want to start learning crochet! You can do it! 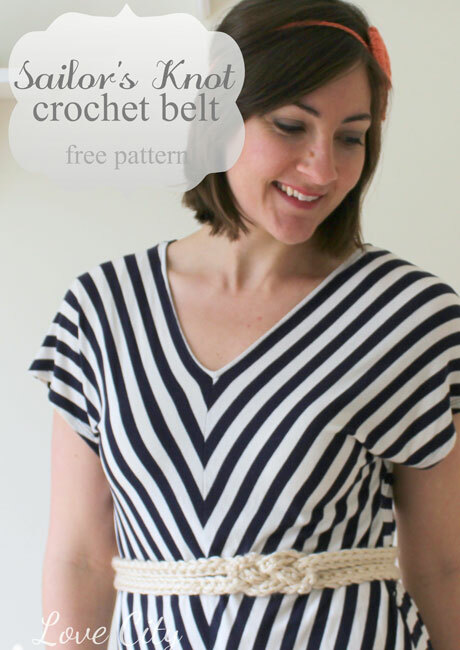 Please let me know if you ever have any questions about this tutorial or any future patterns I post here! Does not appear information on how to put the belt on or do it up so you can take it on and off. Heather, step 7 and photo #9 show you how to attach the strands in the back. You will just sew them together and the belt will be slipped on over the head. The only thing I don’t understand…once you connect the ends, how do you put the belt on? You can put on the belt by simply slipping it over your head! I haven’t made this yet, but after reading the directions, I can’t figure out how you’d put the belt on. Don’t you end up with a (double) loop without openings or ends? Do you step into it & stre-e-e-e-etch it over your hips? !